Engine: 36 x 30"; 35 HP; Davidson & Doran, Kingston, ONT, 1872. Engine from CHINA. Engine compounded in 1891. 32.6' engine-room. Bound Ashtabula, OH for Owen Sound, ONT. Was towing schooner SEVERN; struck reef, broken up & foundered; SEVERN was let go & disappeared. 1873, May 11 First launched. 1874-1882 Operated between Montreal, QUE & Chicago, IL. 1877, Jun 5 Readmeasured; 125.7 x 23.6'; 652.02 gross tons/403.59 net tons. 1886 Owned Mrs. A. R. Christie, Toronto, ONT. 1886, Apr 15 Burned Owen Sound, ONT, Lake Huron. 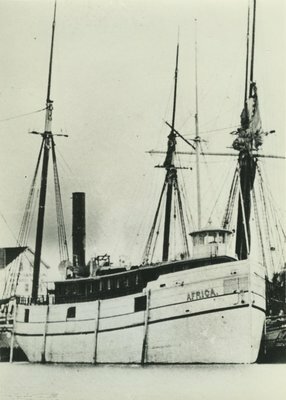 1887, May Rebuilt as steam barge by J. Simpson, Owen Sound, ONT. 148 x 26 x 13'; 485 gross tons/360 net tons. 1895, Oct 7 Foundered off Cove Island, Georgian Bay. 1896, Dec 8 Registration closed.